A widely accepted definition of deforestation as stated by the Global Forest Resources Assessment is “the conversion of forest to other land use or the permanent reduction of the tree canopy cover below the minimum 10% threshold” (FAO 2015). Similarly, the United Nations Framework Convention on Climate Change (UNFCCC) in the Marrakech Accords agreement defines deforestation as “the direct human-induced conversion of forested land to non-forested land” (UNFCCC 2002). The rate of forest loss continues at an alarming rate globally, especially within the past decade (Heino et al. 2015). According to the Global Forest Resources Assessment (2015), the world’s forests which were 4,128 million hectares in 1990 had reduced to 3,999 million hectares by 2015. This means that between 1990 and 2015, there was a net loss of 129 million hectares, equivalent to the size of South Africa. The same significant rate of forest loss is recorded in Africa, especially in sub-Saharan Africa (SSA), where the pressure for land is continuously increasing due to rampant poverty and limited livelihood options. Forest resources have been heavily depended on in Africa, mostly by the rural people that account for 61% of the total population in the SSA (World Bank 2017). In the sub-Saharan Africa and as in other parts of the world, forests play an important role in ensuring food security especially in times of hunger as they provide a safety net through provision of indigenous fruits, mushrooms, and game meat, thereby improving nutrition (FAO 2011). This is especially important for the rural population in proximity to the forest resource, thereby contributing immensely in achieving the 2030 United Nations Sustainable Development Goal of Zero Hunger. People depend on forests and its resources for provision of food (fruits, game meat, nuts, and mushroom), energy (charcoal and fuelwood), income generation, and other forest ecosystem services that facilitate crop production (soil fertility and plant pollination). For example, Africa uses substantial quantities of fuelwood and charcoal as the principal energy source in many households for heating and most importantly for preparation of food. In Cameroon, 2.2 million metric tons of firewood and 356,530 metric tons of charcoal are used in urban areas of the country (Eba’a Atyi et al. 2016). However, these forest resources have been exploited in an unsustainable way in an attempt to meet the demand of the growing population. These demands have created characteristic rings of deforestation outside urban areas where forests and woodland are still available. The main causes of deforestation, however, include clearing for agriculture and settlement, overgrazing, wildfires, charcoal burning, and overexploitation of wood resources for commercial purposes. Moreover, aside from the direct impact deforestation would have on food security and nutrition, there are other long-term implications of deforestation on food security and nutrition which are far more than can be imagined. For instance, deforestation is responsible for about one-fifth of all greenhouse gas (GHG) emissions, ranking second as the leading cause of climate change (FAO 2018). Climate change is recognized to affect food security by contributing to climate variability including frequency of droughts and flooding in some regions, thereby directly impacting on food production. This chapter focuses on sub-Saharan Africa as there is limited forest resource in the Northern Africa, which comprises predominantly of the desert ecosystem of the Northern Africa Sahara. 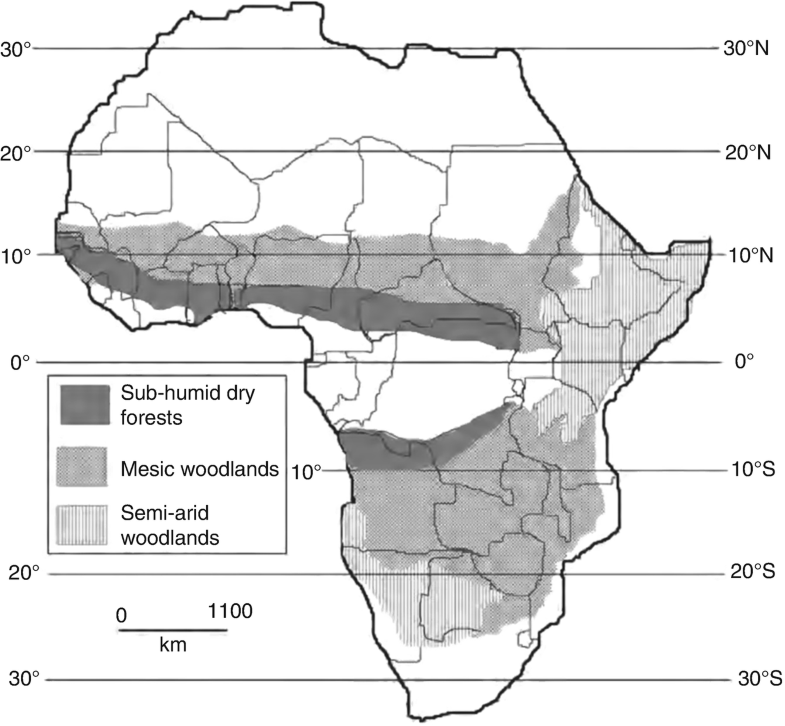 The chapter aims to provide an understanding of different forest types and regions in Africa (see Fig. 1) and further identifies the contributions of these forests to the denizens. The assessment of trends in loss of forest area and its drivers in the different forest types and different subregions of SSA draws heavily from previous works commissioned by the African Forest Forum. Furthermore, the chapter emphasizes the regional determinants of deforestation as a possible basis for identifying potential hotspot areas while elucidating the impacts of deforestation on food security and nutrition in sub-Saharan Africa. The dry forests and woodlands of West Africa stretch west to east from the Atlantic coast, across the southern fringes of the Sahara Desert, to the Ethiopian Highlands and the Red Sea coast. The dry forest and woodland regions are associated with high human population and have been extensively modified by human activities such as subsistence agriculture and animal husbandry for food production. Fire is also an important ecological player and so the natural vegetation is often not easy to determine, and most vegetation now present is secondary wooded grassland and open grassland. The Guinea subhumid dry forest of West and Central Africa stretches from the Atlantic coast in Guinea across the middle regions of Ivory Coast, Ghana, Nigeria, and Cameroon to the Central African Republic and northern Democratic Republic of Congo (DRC), covering an extent of around 1.4 million sq. km. Rainfall ranges from 1200–1500 mm per year in the east to 1500–2000 mm per year in the west. A characteristic species is Parinari excelsa, sometimes forming a forest 18–20 m high, along with Erythrophleum suaveolens, Detarium senegalense, Khaya senegalensis, and Afzelia africana. At the western extent Berlinia grandiflora, Cynometra vogelii, and others are typical, while in the eastern parts in the Central African Republic, Isoberlinia doka, Afzelia africana, Anogeissus leiocarpus, Burkea africana, Borassus aethiopicum, and Terminalia species are found. The oil palm Elaeias and Parkia are commonly found across transformed landscapes. The Sudanian warm mesic dry woodland lies in a parallel band to the north of the Guinea dry forest belt and covers around 2.6 million sq. km, stretching from the Atlantic coast in Senegal. It includes much of Mali, northern Ghana and northern Nigeria, to southern Sudan and southwest Ethiopia (Fig. 2). The major part of the vegetation is disturbed, consisting of open broad-leaved woodland to wooded grassland and bush fallow, often maintained by frequent fire. The moister southern portion, from Guinea to Nigeria, is typified by low woodland, rarely more than 5 m high, of Isoberlinia doka, I. angolensis, Burkea africana, Daniellia diveri, and Erythrophleum africanum, with tall Hyparrhenia grass. It has been likened to depauperate miombo woodland of Southern Africa, but without the Brachystegia and Julbernardia. In the drier north, the environment is marginal for agriculture, and the microphyllous vegetation types are naturally more open, characterized by species of Acacia (especially, Vachellia nilotica, Senegalia senegal, Vachellia seyal, Senegalia macrostachya), Balanites aegyptiaca, Bauhinia rufescens, Boscia salicifolia, Capparis tomentosa, Commiphora africana, Dalbergia melanoxylon, Grewia flavescens, G. vilosa, Pterocarpus lucens, and Saba senegalensis. The Combretaceae family is well represented with Combretum micranthum, C. glutinosum, and C. nigricans. Scattered remnant trees, such as baobab (Adansonia digitata) and shea tree (Vitellaria paradoxa), are common in the landscape. The most common grass species are Aristida hordeacea, Schoenefeldia gracilis, Brachiaria xantholeuca, Cenchrus biflorus, Chloris lamproparia, C. prieurii, and Ctenium elegans with scattered taller Andropogon gayanus (Chidumayo 2011). The Southern African vegetation is generally referred to as the Zambezian Phyto-region. 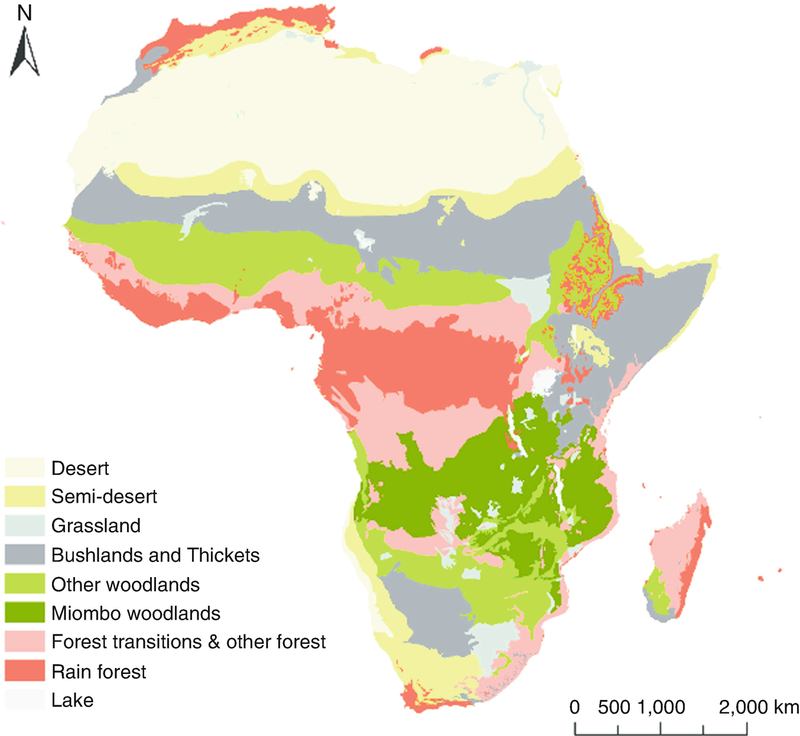 Miombo woodland is a significant biome covering about 10% of the African land masses (White 1983; Fig. 1). The dry miombo woodland occurs in Malawi, Mozambique, and Zimbabwe (White 1983; Frost 1996). Parts of Tanzania are also covered by the Miombo woodlands making up about 90% of all forested land in Tanzania. The other woodland types in Southern Africa are the undifferentiated woodlands of teak and acacia woodlands (Timberlake et al. 2010). The third types are the Mopane woodland and semiarid shrubland that have Colophospermum mopane as the dominant tree species (Timberlake et al. 2010). In East Africa, the most extensive dry woodland types are in the semiarid zone, covering 1.6 million km2 and comprising deciduous microphyllous bushland and thicket dominated by spiny species of Acacia and Commiphora. Other common woody plants include Grewia species, Balanites, and various members of the Capparidaceae family such as Boscia and Cadaba. The baobab tree (Adansonia) is also characteristic at lower altitudes toward the coast and the environs of the Great Rift Valley. The Sahelian region is characterized by high climatic variations from 200 to 800 mm of rainfall per annum, predominance of agriculture and livestock rearing, land degradation, and overexploitation of natural resources by local communities, especially wood for energy (Larwanou 2011; Maisharou 2012). According to Leonard et al. 1983 in Larwanou 2011, the Sahel covers approximately two million square kilometers comprising 27% of Senegal, 39% of Mauritania, 40% of Mali, 7% of Burkina Faso, 50% of Niger, and 32% of Chad. Other authors have included the arid savanna zones as part of the Sahel covering especially most of northern Senegal from Dakar to just south of the Senegal River and extending eastward across Africa, including large parts of central Mali, northern Burkina Faso, southern Niger, northern Nigeria, Chad, Sudan, and Ethiopia (Andrew, 1995 in Larwanou 2011). The Sahel vegetation is semidesert grassland, thorn scrub, and wooded grassland dominated by Acacia spp. (White 1983). The Sahelo-Saharan zone in the northern fringe has relatively few trees including Acacia ehrenbergiana, Vachellia tortilis, and Balanites aegyptiaca. Sparse grass such as Panicum turgidum is found on sand dunes. South of the Sahelo-Saharan zone is more vegetated with characteristic species like Acacia ehrenbergiana, Vachellia nilotica, Senegalia senegal, V. tortilis, Balanites aegyptiaca, Maerua crassifolia, Salvadora persica, Ziziphus mauritiana, etc. Annuals such as Aristida adscensionis, A. funiculata, Panicum laetum, and Schoenefeldia gracilis are found on silt soils. Aristida mutabilis, Cenchrus biflorus, and Tribulus terrestris are found on sandy soils. In the dry savanna part of the Sahel, the vegetation consists mainly of Acacia spp., with Senegalia senegal (gum arabic), Leptadenia pyrotechnica, Salvadora spp., Grewia spp., Vachellia seyal in low areas liable to flooding, and grasses such as Aristida and Chloris spp. (Larwanou 2011). African lowland moist forests occur mainly in Sierra Leone, Guinea, Liberia, Côte d’Ivoire, Ghana, Togo, Benin, and Nigeria in the West African subregion and in Cameroon, Equatorial Guinea, Central African Republic, Gabon, Congo, and the Democratic Republic of Congo in the Central African subregion (Okalli 2011). True rainforest covers only 6% of Africa’s land area, representing about one-third of the total rainforest remaining. The bulk of the lowland moist forest in Africa is located in the Central African subregion and is dominated by the forest of the Congo Basin, where, on the average, close to 60% of the land area is recorded as being under forest cover (Fig. 1). The area of forest available per thousand people is also much greater in Central Africa than in West Africa, signifying the greater population pressure on the forests of West Africa. In general, the Central African forests exist in sparsely populated areas such that, on the average, about 6,000 ha of forest (over 16,000 ha in Gabon) is available per thousand people. By contrast, the average area per thousand of the population is barely 400 ha in West Africa. Wet evergreen forests occur in the West African Moist Tropical Forests (MTF) with the highest annual rainfall and poorest, heavily leached soil. This is followed in the north by moist evergreen forests with annual rainfall between 1,500 and 1,700 mm which is the most important formation for timber production, being rich in commercial species such as utile (Entandrophragma utile), African mahogany (Khaya ivorensis), and wawa/obeche (Triplochiton scleroxylon) which readily attain heights greater than 50 m. The evergreen or semi-evergreen tree species in West Africa include Afzelia africana, Aningeria altissima, Aningeria robusta, Chrysophyllum perpulchrum, Cola gigantea, Khaya grandifolia, and Mansonia altissima. Other important species are Triplochiton scleroxylon, Celtis mildbraedii, Holoptelea grandis, Sterculia spp., and Milicia excelsa. Dry semi-deciduous forests occur at the northern fringe of the moist semi-deciduous forests, where the annual rainfall drops below 1,500 mm. These variants of lowland forests occur in comparable environmental conditions throughout West Africa. Generally, in Africa, mangrove forest covers more than 3.2 million hectares, which span from Angola to Mauritania on the Atlantic coast and from Somalia to South Africa along the Indian Ocean (Bojang and Ndeso-Atanga 2009). According to UNEP (2007), mangroves occur in 19 West and Central African countries from Mauritania (West Africa) in the north with the southernmost stands in Angola (Central Africa). Characteristically, they are found growing along ocean shores and along creeks/riverine shorelines, but they may extend up to 100 km inland. Nigeria, with its extensive shoreline, contains the most extensive mangrove ecosystems, which comprise nearly 35% of the total cover for West and Central Africa (UNEP-WCMC 2007). Mangroves cover in West and Central Africa about 11% of the global mangrove forests. The main species found in the region include Acrostichum aureum, Avicennia germinans, Conocarpus erectus, Laguncularia racemosa, Nypa fruticans, Rhizophora harrisonii, Rhizophora mangle, and Rhizophora racemosa. In Southern Africa, mangroves are distributed along the Indian Ocean coastline from Somalia, Kenya, Tanzania, Mozambique, and South Africa. The Island states of Madagascar and Seychelles also have some mangroves. While there are varying estimates, Mozambique and Madagascar account for the most mangroves in the region. According to Taylor et al. (2003), the main species found include Sonneratia alba, the most common, Rhizophora mucronata, Bruguiera gymnorrhiza, and Ceriops tagal zones. Others include Heritiera littoralis, Xylocarpus granatum, and Avicennia marina. Lumnitzera racemosa is associated with B. gymnorrhiza and Xylocarpus moluccensis along river banks. Provision of food (leaves, e.g., leaves of Adansonia digitata; fruits, e.g., Azanza garckeana; seeds and nuts, e.g., Coula edulis; mushrooms; honey; and wild animals). Provision of fodder and browse for livestock. Provision of fuel for cooking and processing of food. Income from timber and non-timber forest products. Enhancing agricultural production by restoring and sustaining soil fertility. The above-listed contributions are directly linked to the 2030 United Nations Sustainable Development Goal 2, targets 1 and 3, by providing direct source of nutritious food and other non-timber products while facilitating resilient subsistence food production (Goal 2.1 “By 2030, end hunger and ensure access by all people, in particular the poor and people in vulnerable situations, including infants, to safe, nutritious and sufficient food all year round”; Goal 2.3 “By 2030, double the agricultural productivity and incomes of small-scale food producers, in particular women, indigenous peoples, family farmers, pastoralists and fishers, including through secure and equal access to land, other productive resources and inputs, knowledge, financial services, markets and opportunities for value addition and non-farm employment.”). The bulk of food consumed in West and Central African countries are produced in the dry forests and woodlands. According to Muoghalu (2014), woodlands and savannas serve important ecological functions and provide wood and other products that contribute significantly to human well-being at local, national, and global levels. In rural areas of West African countries, a significant relationship exists between food security and the degree of contribution of non-timber forest products to households. About 75% of the poorest people in West and Central Africa live in rural areas where they depend on agriculture and natural resources such as the forests for livelihoods. For example, a review of the Poverty Reduction Strategy Papers (PRSPs) for several countries (Burkina Faso, Mali, Ghana, Niger, and Senegal) where available data showed that between 86% and 93% of the poor live in rural areas. The savannas and woodlands provide wood and non-wood products such as fruits, vegetables, nuts, seeds, roots, mushrooms, spices, bush meat, bee products, edible insects, eggs, and medicines that are particularly important to the livelihood of the communities. They also provide subsistence, employment, and income particularly for the rural poor of the subregions and support household-based enterprises, increasing rural poor’s access to food. For instance, in Congo Basin, 500,000 hunters, who are Pygmies, are directly dependent on forest resources for their daily livelihood (Counsell 2006). In addition, many people in the woodlands and savannas depend on wood as fuel for cooking and heating. For instance, in Nigeria, fuelwood and charcoal account for over 80% of natural energy consumption (Muoghalu 2014). In Cameroon, 2.2 million metric tons of firewood and 356,530 metric tons of charcoal are used in urban areas of the country (Eba’a Atyi et al. 2016). Natural woodland and savanna vegetation of West and Central Africa is widely used for grazing livestock. Livestock browse on shrubs and trees and graze the herbaceous species. Some important fodder species include Afzelia africana, Detarium, and Acacia/Vachellia species that are used as supplementary feed for livestock in the dry season. In areas with large population of livestock, excessive lopping for browse is common practice. The forests and woodlands of East and Southern Africa support livelihoods of the majority of the people through the provision of substantive direct economic benefits (energy, food, timber and non-timber products) and indirect benefits through the provision of ecological services (water catchment, controlling erosion, and moderation of local climate). In Zambia, beekeeping and honey production are an essential part of rural livelihoods, providing about one-fourth of total annual income for tens of thousands of dwellers and complimenting the diets of not less than 250,000 households. Also in Mozambique, several households obtain 30% of their income from unprocessed forest products such as fuelwood, fruits, mushrooms, insects, honey, and medicinal plants (FAO 2011). Moreover, forests and woodlands are the main source of fuel for the majority of the households and thus directly linked to the main threats of deforestation. Annually, Eastern Africa produces about 173 million m3 of woodfuel and about 5.2 million m3 of industrial roundwood, most of which is consumed within the subregion (FAO 2005). The Sahel region of Africa has more than 100 million inhabitants and is among the poorest regions in the world (Potts et al. 2013). Forestry and agricultural sectors, therefore, provide employment for more than 60% of the active population of the region and contribute 40% of its gross domestic product (GDP) (Kandji et al. 2006). The dominant industries in the region are based on agriculture and herding livestock, much of which depend on rainfall. In Niger alone, for instance, forest resources contribute up to 9.5% of the GDP, and the economy relies largely on agro-silvo-pastoral production systems, which contribute about 40% to the GDP of the country (SDR 2003). Furthermore, resources in the Sahelian forests serve as sources of raw materials for crafting and roofing and an array of non-wood forest products such as medicine and other uses. In Sahel region, trees outside forests are also important suppliers of wood and non-wood forest products due to the decline of natural forests. For instance, it was estimated that Niger has more than ten million ha of agroforestry parklands with a mean density of 40 trees per ha (Larwanou 2011). Private woodlots are also used to produce much required poles and fuelwood supply (Maisharou et al. 2015). Furthermore, trees are planted across the Sahelian region to restore fertility of degraded land through the initiative known as the Great Green Wall. This initiative has improved the life of several millions of people in the Sahelian region by boosting food security, creating job opportunities for communities while developing resilience against climate change. For example, in Senegal, 11.4 million trees were planted, and 25,000 hectares of land of degraded land have been restored, while in Nigeria, five million hectares of degraded land have been restored and 20,000 jobs created (UNCCD n.d.). Like other forests on the continent, moist forests are intricately linked to the socioeconomic and productive systems of people in Africa. Tropical forests underpin the economies of many countries that have them, supporting, besides industrial wood production, livelihoods that are based on agriculture, extraction of wood for energy and housing, and collection of non-wood products for food, medicine, and various other uses. For example, in Cameroon, some of the fruits such as the moabi fruit (Baillonella toxisperma) contain important daily macro- and micronutrient requirements (Fungo et al. 2015). Also, game meat is the second most valued forest product after timber in the moist tropical forests. Game meat is not only an important component of nutritional security and livelihoods in the rural communities but also widely consumed in the urban areas as a source of animal protein (Wilkie and Carpenter 1999), reaching consumption rate of about five million tons in the Congo Basin (Fa et al. 2003). Furthermore, in the tropical forest regions, biofuel is growing rapidly, contributing to energy security and improving local incomes, thereby improving the access component of food security. However, biofuel production has been linked to environmental impacts such as deforestation, GHG emission, biodiversity loss, etc., and these impacts remain a major downside of this opportunity to date. Mangroves fulfill important functions in terms of providing wood and non-wood forest products, coastal protection, conservation of biological diversity, provision of habitat, spawning grounds and nutrients for a variety of fish and shellfish, and salt production (UNEP 2007). With high coastal populations, rapid urban growth, and a high dependency of coastal populations on fish for protein, fuel, timber, and rice production, pressures on mangroves are high (FAO 2005; UNEP 2007). For example, in Senegal, local women in Mangrove forest regions earn up to US $20/day through fish farming, while in Ghana, mangrove contributed more than US $500 per hectare (Bojang and Ndeso-Atanga 2009). Globally, direct drivers of change encompass habitat change and degradation, climate change and extreme weather events, overexploitation of natural resources, and invasive species. Similar drivers are experienced in sub-Saharan Africa (SSA) including the dry land forest and woodland regions of the Sahel, Eastern, and Southern Africa. The leading drivers identified in this part of Africa include population growth and demography, agricultural expansion, and energy needs (Chirwa et al. 2015a, b). It is important to note that due to increase in population growth, the demand for forest resources to meet basic needs including food also increases. These demands, however, are met in an unsustainable and overexploitative way, leading to deforestation and reducing the contribution of forests to food security. An example of such unsustainable activities includes shifting cultivation and slash-and-burn activities which are still being practiced in many region of SSA. The impact of deforestation on food security and nutrition is directly linked to the decrease in capacity of the forests to contribute to food and nutritional security. While a number of these drivers are consistent across the different forest types in SSA, the degree of impact on the forest resources differs. The high rates of deforestation in Africa are in Uganda (3.3%) and Comoros (1.1%) in Eastern Africa, Zimbabwe (1.8%) in Southern Africa, and in Central and West Africa in Chad, Mauritania, Benin, Mali, Niger, Nigeria, and Togo ranging from 1.3% to 5% (Table 1). Natural woodlands and savannas of the West and Central Africa are declining mainly due to agricultural expansion, overharvesting of forest resources especially to supplement human and livestock needs in times of scarcity, increased fuelwood collection, overgrazing, bushfires and fast urbanization, industrialization, and drought (Muoghalu 2014). Commercial or subsistence agriculture to meet the food requirements of the growing population and foreign currency needs of the countries of West and Central Africa has resulted in growing pressure to increase the area under agriculture leading to the extensive clearing of woodlands and savannas in the West and Central Africa. The greatest impact of agriculture has been in West Africa, where more than 50% of woodlands have been converted to agricultural use (Chidumayo 2011). As earlier discussed, woodland and savanna populations exploit vegetation resources for fuelwood, timber, and medicinal purposes. They harvest foliage of plant species as top-feed, especially in the parklands, for human beings and livestock. They also collect huge amounts of seeds and pods of trees and shrubs for subsequent preparation for food. The scale on which seed collection and cutting of plants is carried out has an adverse effect in the natural process of regeneration and growth and productivity of certain species. Overgrazing is especially a serious problem in the Sudano-Sahelian belt where overstocking often results in serious damage to the vegetation. The resulting pressure from overgrazing, over-browsing, and lopping of vegetation for fodder is a major contributor to deforestation and desertification. The East Africa region harbors 3 of the 34 global biodiversity hotspots, and these include Eastern Afromontane, the Horn of Africa, and the Coastal Forests (Mangroves) of Eastern Africa. Forests in the Eastern Arc and the Albertine rift have been found to be rich in biological diversity (UNEP 2002). Throughout the subregion, the off-take rate from the forest is more than the natural regeneration capacity. Deforestation is mainly caused by unsustainable agricultural practices, intensive livestock grazing, and wildfires. Forests and woodlands are the main source of fuel for the majority of the households in East and thus directly linked to the main threats of deforestation. For example, in Malawi, woodfuel accounts for 90% of the energy supply, although this is under threat due to deforestation (Malakini et al. 2014). The status of the woodlands in Southern Africa is therefore heavily disturbed, with the very little old-regrowth woodland remaining. While forest cover continues to decline (Syampungani et al. 2009), very little investment is made in afforestation and reforestation. In Southern Africa, the main determinant of forest cover loss includes inappropriate agricultural activities, including shifting cultivation and slash-and-burn activities that are still practiced in many parts of the region. These practices are no longer sustainable and are responsible for vast amounts of forest clearing and declining soil fertility. In addition, impoverished subsistence communities often have no choice but to rely heavily on wood as fuel and on the wild plants, animals, and other resources that natural forests and woodlands provide. For example, charcoal production and trade provide income-generating opportunities for both the rural and the urban communities of Southern Africa. In Zambia alone, the charcoal industry has been reported to generate and support about US$30 million and 60,000 Zambians, respectively (Kalumiana and Shakachite 2003). According to Falcão (2008), 150,000 families are employed in charcoal production in Mozambique, and on average the annual income generated is about US$ 250–300 per family. In Malawi, estimates show that 92,800 people owe their livelihood to the charcoal industry (Kambewa et al. 2007). In fact, the whole of southern and central Malawi is virtually devoid of forests characterized with few remaining state-owned forests. Deforestation varies across Southern Africa, with Zimbabwe having the highest rates. A number of factors may be attributed to the variation in deforestation rate from country to country, namely, political instability affecting the economic well-being of the citizens, population increase, etc. Overexploitation of forest resources, overgrazing, desert encroachment, increasing population and aridity, and strong climatic variation and irregular rainfall are some of the challenges that have characterized the Sahel region of Africa (Gonzalez et al. 2012). Furthermore, rainfall in the Sahelian zone is erratic, with large differences between years. Rainfall patterns have been dominated by sequences of drier and wetter years. For instance, the 1970s and 1980s showed particularly severe droughts in the Sahel, with rainfall in the years 1983 and 1984 showing the lowest in the century. Nevertheless, since the mid-1980s, overall rainfall has gradually increased. Land conversion and degradation in the Sahel have emerged as a primary concern. Land conversion stems from a wide range of social and economic processes that are highly variable in both space (between counties and between ecological regions within countries) and in time (as economic and other drivers of change). Forests are removed faster than the rate they are replaced; this is if any restoration is carried out in the first place. Deforestation accounted for loss of more than 600 thousand hectares each year in the Sahelian countries (Maisharou et al. 2015). Nigeria and Mali have the highest rate of deforestation, while Mauritania is having the least (FAO 2005). Moist tropical forests in West Africa that were estimated to be more than 1.5 million km2, in the early twentieth century, are currently less than 0.3 million km2 in area; and this makes them one of the most degraded tropical ecosystems on the planet (Akande 2012). There is enormous pressure on the limited forest in West Africa, for its conversion to other uses. Increasing human population is all together degrading the environment at an alarming rate. Much of the biodiversity is irreversibly lost through extinction caused by the destruction of natural habitats (Akande 2012). Hence, urgent action is needed on the moist tropical forest ecosystems, among all other major habitats, because they face a great danger of being destroyed. Conservation status of the moist forests is therefore considered critical. Some of the key drivers of deforestation in the tropical moist forests include inter alia degradation of forest by fire, unsustainable deforestation/overharvesting, traditional agricultural practices, etc. The moist tropical forests of West Africa are facing an increasing fire threat. The impacts can be devastating, destroying homes, livelihoods, and wildlife and polluting river systems. The moist tropical forests remained relatively free of large-scale human-caused fires probably because of their close canopy structure until the canopy started opening up from unsustainable logging practices. It was reported by FAO (2015) that about 19 million hectares of forest were lost to fire in Africa as estimated in 2010. Forests are also being converted to industrial-scale plantations such as oil palm and rubber, and fire is often employed to remove unwanted biomass. Logging helps to dry out the soil and vegetation thereby creating flammable debris that increases the forests’ vulnerability to fire. The unfortunate aspect is that many TMF, once burnt, enter a cycle of increasingly frequent fire events until they have been converted to fire-tolerant grasslands and savannahs (Bellefontaine et al. 2000). Deforestation in the subregion is closely tied to demographic conditions: the highest level of deforestation has occurred in countries with higher population growth rates and higher population densities (FAO 2005). Human settlement and economic activities result in infrastructural development (roads), increased agriculture, bush fires, overharvesting of timber, and NTFPs; all these activities influence environmental change. According to FAO (2005), the high population density in Nigeria (92 people km-2) has resulted in a great local demand for wood products, which often leads to intense political pressure to convert the forests to agriculture. FAO (2005) reported that Ghana documented a decline in natural forest area between 1980 and 1990 at an annual rate of 138,000 ha. Other countries have been significantly degraded prior to this period, but corresponding statistics revealed the annual rates for Liberia at 25,000 ha, Nigeria at 119,000 ha, and Sierra Leone at 12,000 ha for the period being considered. Increasing population pressure and its resultant impact on forest degradation have been two of the most important factors influencing the evolution of policies. Over 70% of the population in the subregion is engaged in agriculture, and, because of the rapid increase in population and the continuing extensive use of bush fallowing and land rotation, forestland in the subregion is under severe pressure. They also command international attention because of their rich biodiversity and the unique products this provides, as well as their high productivity and potential to influence climate. However, in recent times especially in Central Africa, there is a concern for large-scale clearing of moist forests to substitute them with biofuel plantations (Ambali et al. 2011). Historically, mangroves have in the past been regarded as swampy, mosquito-infested, muddy wastelands and been cleared in the interest of public health (AFROL 2002). They have also been converted into other uses for high profit but short-term gains (Popoola 2013). It has emerged that mangroves are among the most productive terrestrial ecosystems and are a natural, renewable resource (FAO 2005). Throughout West and Central Africa and East and Southern Africa, the livelihoods of coastal populations depend heavily on access to natural resources. Coastal development in West Africa is the most important direct driver of mangrove forest change, especially between 2000 and 2006, a period that coincides with large oil discoveries in the region (Njisuh and Gordon 2011). There is concern that the long-term values of intact and functioning ecosystems are not being recognized in current policy decisions, where short-term gain resulting in loss of the ecosystem is being pursued at the expense of long-term sustainability. Fatoyinbo et al. (2008) indicated that mangroves of Africa were rapidly declining and that the trend was likely to continue. Mcleoa and Slam (2006) further asserted that an additional 25% of developing countries’ mangroves would be lost by 2025 thereby affecting the livelihoods and well-being of millions of vulnerable coastal communities and local governments that directly or indirectly depend on their resources. This is already happening as large chunks of mangroves are now being exploited in many West and Central African as well as East and Southern African countries for short-term gains. According to Popoola (2013) and UNEP (2007), population growth and urban development in the coastal zone, economic and political trends, and climate change are some of the threats to the mangroves, similar to those of other forest formations. A combination of these factors has contributed to the observed decline in the prevalence and significance of the mangroves in West and Central African countries. As demands for building materials, fuelwood, and other domestic requirements increase, the mangrove population declines correspondingly and so do the services they provide. Oil thefts and spillages in the creeks and along the coast of Cameroun, Gabon, and Nigeria are also emerging as key threats to the well-being of the mangroves (Popoola 2013). Other threats include gas flaring, canalization, siltation, sand mining, and construction of embankments (Ekweozor 1989; Isebor and Awosika 1993 in Popoola 2013). On the economic front, large-scale disturbance of the biophysical environment arising from such human activities as farming, illegal logging, oil prospecting, and exploration, including their associated externalities, has led to the deforestation of sizeable portions of the Stubb’s Creek Forest Reserve in Akwa Ibom State, Nigeria, which hitherto harbored some sizeable mangroves (Popoola et al. 2004). Similarly, in East Africa, the rivers, streams, and mangroves are used as dumping sites for the textile, chemical, paper, sugar, and oil industries within the region. In Kenya, Tanzania, and Mozambique, agricultural and silvilcultural effluents enter mangrove areas. In Somalia and Madagascar, the concentration is more on livestock industries. However, industrial pollution is not a severe problem in the region as it is still small scale. Eastern Africa is also undergoing an extraordinary rate of urbanization. The pressure on mangroves from human populations varies immensely across the region. In Madagascar, over 90% of households depend on fuelwood and charcoal (including mangroves). By contrast, only 8% of people in the Seychelles depend on fuelwood, even as a supplementary source of energy. The effect of this, on the extent of mangrove forests in Madagascar, is therefore substantial. Selective harvesting removes high-quality mangroves leaving lower-quality species to repopulate the now depleted area. Furthermore, lower-quality mangrove wood, smaller trees, or species less used in construction provide less income. In Chwaka Bay on Zanzibar, for instance, poles used in construction are of a relatively poor quality and are sold for TSh4 000 to 5,000 (currently US$55 to 75), whereas wood imported from mainland Tanzania can be sold for TSh9 000 to 10,000 (US$125 to 140) as it is of a higher quality (Taylor et al. 2003; Table 2). Evidence has shown that one in nine people in the world are living in hunger, with a more worsening situation in most parts of Africa. Forests are recognized to contribute significantly to food and nutritional security, through provision of nutritious food and decent income. The highest percentages of people living in Africa are rural poor, and their entire livelihoods and not only food depend heavily on forest resources. Conversely, there has been a dramatic loss in the forest area, especially the primary forest in the past few decades, affecting people and the environment. Population growth, agricultural expansion, and exploitation of forest resources are the main drivers of deforestation in the sub-Saharan Africa. Several unsustainable approaches have been taken to ensure food security, but such approaches have proved to be an “out of a frying pan into fire” situation because they lead to more deforestation and increased food insecurity. An example of this approach is the agricultural expansion, whereby other land uses including forest lands are being converted to agricultural land with the notion of increasing agricultural production. However, a more sustainable approach that needs to be embraced could be to practice sustainable agricultural intensification, which emphasizes the increase in production of agricultural production per unit area. Also, another sustainable approach is to practice multifunctional land use systems or multiple land use systems such as agroforestry systems. The need for country-specific selection of the most vulnerable forests to be prioritized for detailed and urgent study of the extent of forest loss is important. The identification of the extent of deforestation must be coupled with a socioeconomic analysis to fully understand the dynamics of land use land cover change. In addition, the geospatial analysis must be supported with some ecological assessment in order to understand the extent of the threat to the biological diversity in the different forest ecosystem types. Conclusively, it is important that urgent attention should be given to halt deforestation in Africa through forest protection, reforestation, and sustainable use of forest resources if development that is sustainable will be attained for all, or else, the 2030 United Nations Sustainable Development Goal of Zero Hunger might be a forlorn hope, at least for the African continent.